As the tag line “Second Thoughts” indicates, it’s a look back at my first three mocks – from Mock 8 1.0 First Selection to Mock 3.0 -- Combine Impact. The 3.0 picks were supposed to hold up in the final mock because they were based on Combine performances. However, a lot happens from mock to mock to cause second thoughts about picks. Call it mock shock. One potential change in a team’s pick for any reason – rumors, comments about possible trades, rising and falling stock of prospects – causes shock waves that affect picks below it. Some of that in Mock 8 4.0 creates the second thoughts. Following are the second thoughts on my Mock 8 3.0, and why they might cause me to change picks in Mock 8 5.0—Final Selection, my set-in-stone final mock. Mock 8 3.0 pick: QB Kyler Murray, Oklahoma. Previous mocks: DE Nick Bosa, Ohio State, in both. Second thoughts: I think Bosa is the right pick for the Cardinals to build a franchise. And I think Murray is the right pick to give the franchise a badly needed shot of adrenaline. Bottom line: It’s 50-50 in my mind on whether to stick with Murray or switch in my final mock draft. Hardly a comforting thought, because getting the first pick wrong can make the rest of the mock draft fold faster than Mary Poppins’ umbrella in a hurricane. Mock 8 3.0 pick: DE Nick Bosa, Ohio State. Previous mocks: DE/OLB Josh Allen, Kentucky, in both. Second thoughts: Everyone’s giving the 49ers the best pass rusher on the board with this pick. That should be comforting, except for one thing: When has everybody been right about anything in projecting draft picks? Bottom line: The 49ers are at the mercy of the Cardinals and whether they’ll take Murray or Bosa. Or – the draft gods forbid – somebody else. Mock 8 3.0 pick: DT Quinnen Williams, Alabama. Previous mocks: Quinnen Williams in both. Second thoughts: None. I think Williams is the best player in the draft. Bottom line: It’s uncomfortable feeling this sure about anything. It gives me second thoughts about not having second thoughts. Mock 8 3.0 pick: DE/OLB Josh Allen, Kentucky. Previous mocks: DE Rashan Gary of Michigan in both. Second thoughts: It’s the Raiders. That says it all. They’ve been unpredictable since Jon Gruden was hired as head coach last year. Gruden has been interviewing quarterback prospects this year, despite having three-time Pro Bowler Derek Carr back for his sixth season. Bottom line: Be ready for anything with the Raiders – except doing the obvious. Mock 8 3.0 pick: DE Rashan Gary, Michigan. Previous mocks: CB Greedy Williams of LSU, then OL Jonah Williams of Alabama. Second thoughts: Buyer’s remorse comes from what’s being projected currently about the Bucs’ draft plans, not from having given them three different players in the first three mocks. The consensus is that they’ll take LSU Devin White – who I had going to the Lions in Mock 3.0. Bottom line: Sweat it out for two weeks and hope the consensus on White is wrong. Mock 8 3.0 pick: OL Jonah Williams, Alabama. Previous mocks: QB Dwayne Haskins, Ohio State, in both. Second thoughts: My pick of Jonah Williams was a product of breaking my no-trade caveat in mock drafts and predicting that the Cardinals would trade QB Josh Rosen to the Giants in a deal that did not included the Giants’ first-round pick this year. It still makes sense to me – assuming I’m right about the Cardinals drafting Kyler Murray. In other words, I have to be right on a lot of things. Bottom line: There’s still a chance to get both picks right in Mock 5.0. 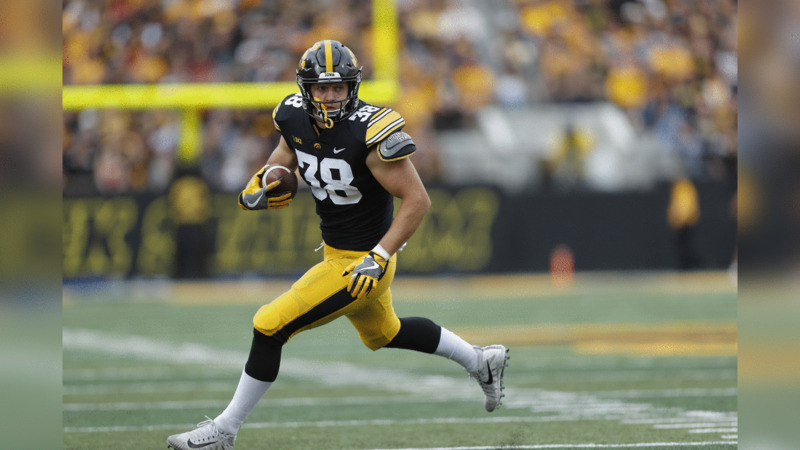 Mock 8 3.0: pick: TE T.J. Hockenson. Previous mocks: Kyler Murray, then QB Drew Lock of Missouri. Second thoughts: All wrong with the first two mocks, but there was an excuse. Both were made before the Jags signed free agent QB Nick Foles. Hockenson looks like a good pick for the Jags, but there’s a lot of sentiment out there for the Jags to take an offensive lineman. Bottom line: There’s some consolation in projecting that the Jags would fill their needs at quarterback, but that doesn’t help the crumbling state of my mock draft. View photos of NFL prospect T.J. Hockenson. Charlie Neibergall/Copyright 2017 The Associated Press. All rights reserved. Chris O'Meara/Copyright 2019 The Associated Press. All rights reserved. Previous mocks: DE Clelin Ferrell, Clemson, in both. Second thoughts: Where to start? How about with being sold on Clelin Ferrell twice, and now it looks like he won’t even be a top 15 pick? Or that GM Bob Quinn said in a recent national podcast that he’s “open for business” in listening to offers to trade down in the first round to get more picks? And then there’s the recent national tidal wave of support for the Bucs to take Devin White at No. 5. It all adds to a lot working against White even being available at No. 8. Bottom line: Getting it right Mock 8 5.0 is what counts. All the others were Mock Draft OTAs – noncontact practice for the real thing. In fact, I probably could have skipped one or two and showed up the week of the draft.